Correction: In reading the census tables, I thought Butte County had the highest percentage of Chinese residents in the state, but that honor goes to Trinity County. Although small in population, Trinity County had the largest proportion of Chinese miners and railroad workers. In 1880, out of a population of 4939, 1951 (almost 40%) were Chinese. Butte County reached its peak in 1852, when a state census showed 25% of Butte County residents were Chinese. The percentage was 20% in 1880 This fell off steeply after the Chinese Exclusion Act was passed in 1882. Chinese immigration was rigidly limited, and older Chinese men (it was almost all men) died or returned to China. When gold was discovered in 1848, it did not take long for the news to reach China. Chinese gold-seekers, mostly from the province of Kwangtung started arriving in 1849 and continued coming throughout the next three decades. Immigrants on sailing ships from China could actually reach San Francisco in less time than it took to travel around Cape Horn, 4 months vs. 6 months. At first the Chinese population in Butte County was concentrated in and around Oroville, where the men engaged in mining. Chinese miners took over abandoned gold claims and through diligence and teamwork extract the traces of gold left behind by less patient white miners who had moved on. They managed to make a living out of “played-out” mines, in spite of the burden of the Foreign Miners’ Tax. The Foreign Miners’ Tax was levied against non-native born miners, but in reality it targeted only the Chinese. Foreign miners from Europe or South America were not hassled for the tax. The law passed in 1850 called for a tax of $20 per month. When this proved to be too high to collect, the tax was reduced to $4 per month in 1852. This was a major source of revenue for the state of California and it can be argued that state government was built on the backs of Chinese miners. Mining remained a major occupation for Chinese workers throughout the 19th century, but as the gold dwindled, they moved into other occupations and became everything from ditch diggers and wood choppers to laundrymen and merchants. 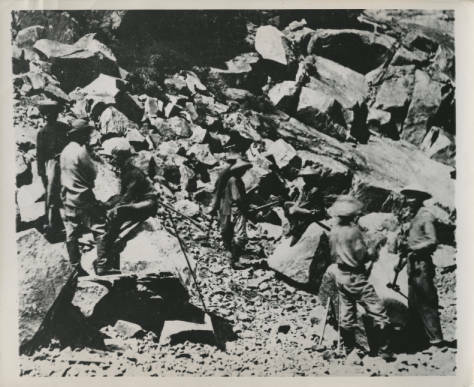 Many Chinese workers had also come to work on the transcontinental railroad, and when that was completed they migrated to the valley and swelled the ranks of available labor. Some of the above information was taken from The Chinese in Butte County, California, 1860-1920, by Susan W. Book. Very interesting, and what an historical loss. Were the buildings abandoned? By then all but a few Chinese had left Chico.